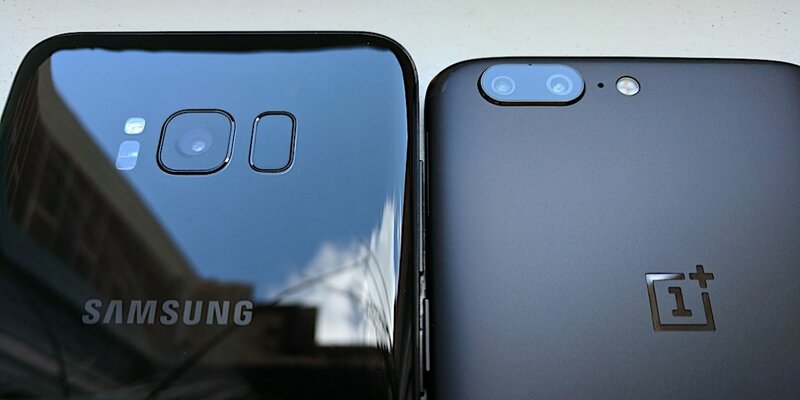 OnePlus 5T vs Samsung Galaxy S8 – Which One Should I Buy? 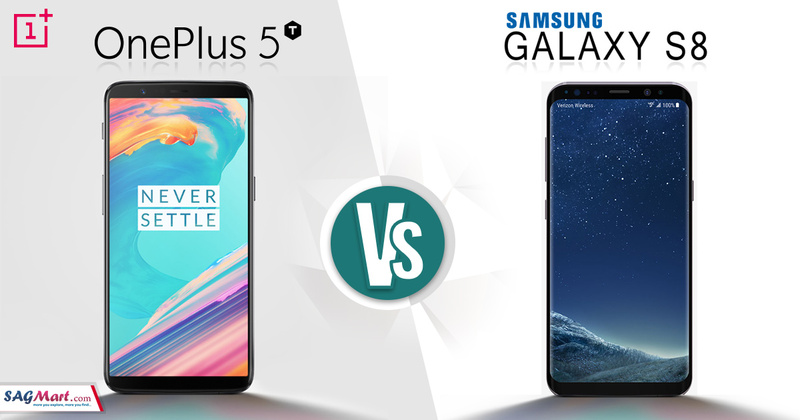 If you’re looking to buy a recently added new Android flagship smartphones and confused betweenOnePlus 5T vs Samsung Galaxy S8 then this post can help you. 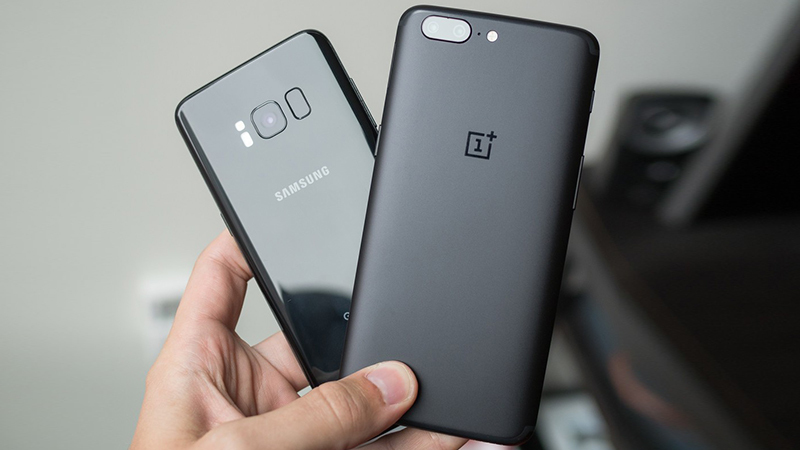 Today, We are comparing the Samsung Galaxy S8 with the new OnePlus 5T and we will explain the key difference between these two Android smartphones. OnePlus 5T vs Samsung S8 Specs: Which has the better features? Samsung comes with top-of-the-line specs. It’s powered by the Snapdragon 835 or Samsung’s own Exynos 895 chipset, depending on the region. The handset has a 4 GB of RAM, which is still more than enough even for power users. The phone has a smaller 5.8-inch Super AMOLED display that offers a higher QHD+ resolution. It also has a slightly different 18.5:9 aspect ratio and is curved on the sides. The handset packs a 64 GB of expandable storage and sports a 3,000 mAh battery. It supports Fast Charging technology that gets the battery to 100 percent in 92 minutes according to the firm test, making it slower than OnePlus’ Dash Charge. The OnePlus comes with a 64GB or 128 GB of non-expandable storage and sports a 3,300 mAh battery. It supports the company’s Dash Charge technology that will get the battery to 100% in around 90 mins. In addition to the fingerprint scanner, it also features facial recognition that allows you to unlock the device just by looking at it. Extra features refer are dual-SIM support and the signature Alert Slider located on the left side, which lets you switch between three notification profiles: Silent, Do Not Disturb, and Ring. 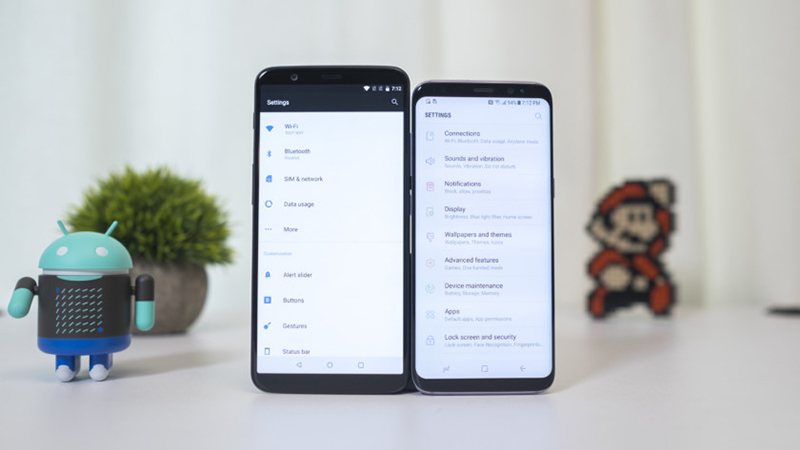 Both the smartphones have their own merits and demerits, a comparison mentioned above for Samsung s8 vs OnePlus 5t in a tabular form you check their specs side by side. Both the smartphones are priced very differently, and one of the biggest areas this shows is in design. Samsung’s Galaxy S8 is a stunning phone, build of glass and metal with curved edges of the display that give off a futuristic vibe and a very high-end look. This is one of the sexiest smartphones Samsung has ever made. Unlike the OnePlus 5T, the device has a glass back. It looks and feels just as awesome as metal but does have a few drawbacks. It can crack when dropped on a hard surface and is also hungry for fingerprints sensor, but the overall design is certainly more functional than flashy. Both handsets feature a rear-facing fingerprint sensor and a headphone jack on the bottom, but only the Galaxy S8 boasts an IP-rating for water-resistance. Between Oneplus 5T vs Samsung s8, both have an ‘all-screen’ front and minimal bezel around the display. The Samsung S8 comes with features a 5.8-inch screen display with a resolution of AMOLED 2960×1440. On the other hand, OnePlus 5T is a bigger screen size compare to S8 comes with 6-inch Optic AMOLED, 2160×1080 (18:9). The Galaxy S8 sports a 12 MP shooter on the back camera with large dual pixels, f/1.7 aperture, optical image stabilization, phase detection autofocus, and LED flash. There’s also a front-facing camera on board that has an 8 MP sensor and comes with a Smart Autofocus system. Like the S8, the OnePlus 5T features a large 6-inch AMOLED display with Full HD plus resolution and the popular 18:9 aspect ratio. It should handle everything you throw at it. The phone offers a Snapdragon 835, but it’s pairing it with more RAM (6/8GB rather than 4GB). The device is equipped with a The dual camera setup on the OnePlus 5T offers a 16-megapixel and the 20-megapixel camera, no optical Image Stabilisation (OIS) and a f/1.7 aperture on both cameras. The 20-megapixel camera here is for allowing some extra zoom in pictures and a silky portrait mode. 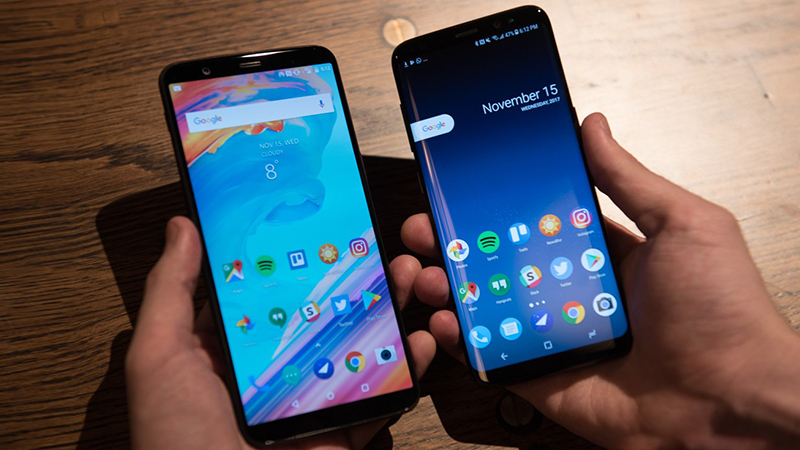 At a speed comparison test between OnePlus 5T vs Samsung S8, We tested 20 apps in both the smartphone one after the other, in two successive rounds. While initial round shows the speed with which any app is launched for the first time, the second one shows the capability of the smartphone to launch an already opened app. Especially, OnePlus 5T did not just manage to open all the apps faster than the Galaxy S8 phone under consideration, it managed to do so without breaking a sweat. The Samsung Galaxy S8 smartphone managed to go through two test rounds in around 2 minutes 2 seconds respectively. OnePlus 5T managed to go through both rounds in around 1 minute 53 seconds. However, the OnePlus 5T that was used to test the speed features an 8GB RAM while the Samsung Galaxy S8 comes with 4GB of RAM. The additional (4GB) memory of OnePlus 5T is definitely going to have a positive impact on the performance of the phone as compared to the other similar smartphones in the market. It also means that the phone will perform exceptionally well in real-world usage and to manage multiple applications. Have a look: OnePlus 5T V/S Pixel 2: Which Is Best For You? Right now, the OnePlus 5T runs on Android 7.1.2 Nougat, which, while disappointing in a world of smartphones launching with Oreo, is still a newer version than the Galaxy S8, which is stuck on 7.0. The 5T is the first OnePlus device without capacitive buttons, there may be a slight learning curve for those coming from older OnePlus smartphones, but the firm has maintained its bevy of shortcuts and gestures to make navigating the Android OS easy. OnePlus also promises an update to Oreo by the end of the year 2017, which may actually be sooner than Samsung’s similar to the Galaxy S8 series. Want to know which offers better value for money? OnePlus are great not only because they have the latest internals, but because they offer excellent cost for money. The OnePlus 5T Comes with the price tag of Rs. 32000 for the 64GB variant and Rs.38,000 (Check Price at Amazon) for the 128GB version. The Samsung Galaxy S8 might be a slightly older device, but it’s still pricier. The Samsung S8 offer 64GB variants with the price tag of Rs, 53,900 plus 4000 cashback on HDFC credit card (Check price at Flipkart). 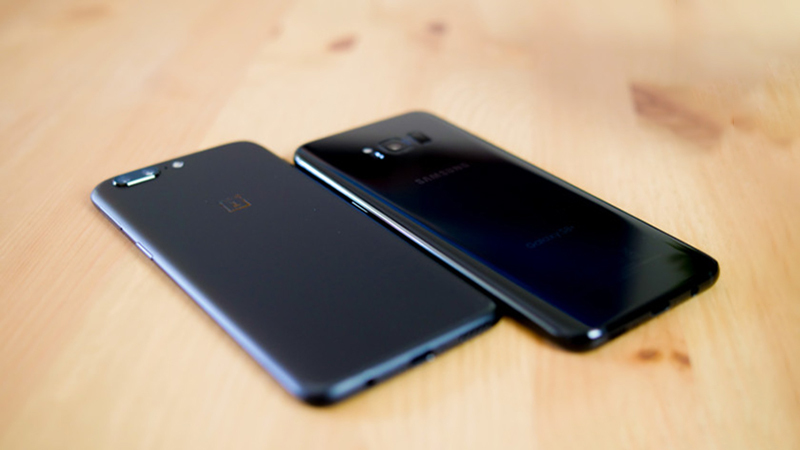 The Samsung Galaxy S8 and OnePlus 5T are similar when it comes to performance, but there are a lot of differences between samsung s8 vs oneplus 5t that makes it difficult to say one is better than to the other. The Samsung S8 is made of glass and has a smaller display that makes the handset more compact. The screen also has a higher resolution and features.The single SIM mobile has a microSD card slot, will survive in up to 1.5 meters (five feet) of water for 30 minutes and supports wireless charging. The phone is little more expensive, but you can come across a great deal from time to time that can significantly reduce the price. The 5T has a metal body, more RAM, a larger screen, and comes with more internal storage in the highest-end option. It’s also a lot cheaper, supports dual-SIM, and the dual-camera setup, which allows you to capture those bokeh images that are all the rage these days. Thanks a lot for such a detailed comparison.